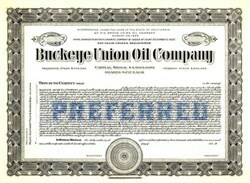 Beautifully engraved RARE SPECIMEN certificate from the Buckeye Union Oil Company printed in 1922. This historic document was printed by the Jeffries Banknote Company and has an ornate border around it with the company name top center, and an underprint of the word "Preferred". The company's name was changed from the Rio Bravo union Oil Company to the Buckeye Union Oil Company as a result of a court order dated December 2, 1922.